Trulia added an iMessage functionality to the Trulia Real Estate and Rentals iOS apps. The iMessage update allows consumers to share property photos and other information, such as a home's price and open house times, without leaving the iPhone messaging app. 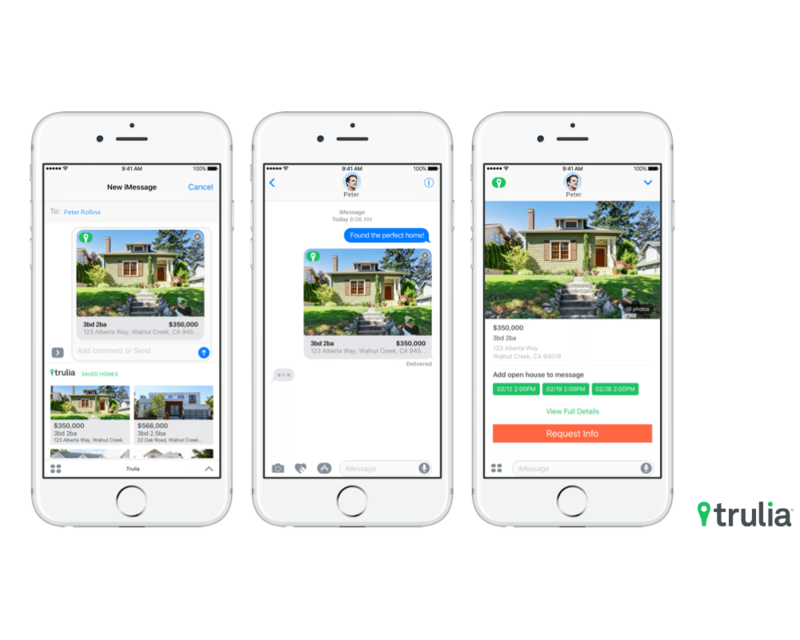 “It takes two to make a thing go right, it takes two to make it outta sight,” — that’s Trulia’s sentiment as the Zillow Group brand releases an iMessage extension to make the mobile home search process collaborative and fun. “Our goal at Trulia is to provide home shoppers the tools they need to move fast in finding their next home,” said Trulia Mobile Product Manager Mili Dutta in a blog post announcing the extension. The iMessage extension is available on the listing site’s Real Estate and Rentals apps, and it enables users to view and share saved homes, coordinate open house visits and see property details all without leaving the iPhone message app. Zillow and realtor.com also have iMessage extensions available that allow users to view saved homes, share property photos and other information. The Trulia iMessage process from click to send. To access the Trulia extension, iPhone iOS 10 users must click the app store logo within Messages and turn on the Trulia iMessage app. Once the extension is active, users will be able to see all of their saved homes. From there, users can click on a home and send it to their family, friends and real estate agent. And voilà, the recipient will receive a message that includes a large image of the listing along with the price and the number of beds and baths. If they would like to see more, recipients can tap on the image to get more detailed information and open house times.